Most of my writing life has been taken up with history and heritage, guide books for hikers and serious historical studies, factual stuff not requiring a free and fanciful imagination. Before I get to that freewheeling imagination let me tell you something of myself. I was born in the first half of the twentieth century, in north county Dublin on a small farm. I became a precocious reader by the age of seven or eight. Avoiding farm chores I would hide away in the hay field with my red hard covered Regent Classic published by Thames Publishing Company of London, The Black Arrow or Jane Eyre, or some such novel. I read most of those classics by the time I went to secondary school; I still have many of them on my book shelf. And yet it was history that caught my attention, undoubtedly it was a teacher somewhere along the way that motivated me. Anyhow I went on to teach History and English for 30 years, English being my main subject but history was my forte. History combined with a love for the outdoors, visiting historic sites etc., led to writing guide books. I co-authored The Bangor Trail, The Western Way, and The Foxford Way, all these trails in county Mayo in the west of Ireland . All that began in the late 1980’s. Then came the serious one, a history of a psychiatric hospital, St. Mary’s of Castlebar, County Mayo. I should mention that by now I was living with my wife and family in county Mayo, teaching locally. Early retirement became a possibility and I chose it. Now I would have a small pension and the time to do other things. Making a documentary was one of those undertakings, the learning curve was steep, script writing, presenting in front of camera and so on. Old port to Newport, an Historic Journey was the result. My film partner and I are successfully marketing it on our http://www.purplefoxglovefilms.com/ website. We are working on a second documentary. As I was developing my script writing I began to experiment with an idea that has been with me for years. What if, I asked myself, what if some rare Irish manuscripts had made their way to America instead of the great monastic libraries of Europe, where would they be now? Who would have brought them to America, when and why? While history writing demands sources, historical fiction allows some latitude, especially with characters that people the work, the sources can still be problematical, but one can invent a little, or a lot! And so began my novel Sheegorey. I had no name when I began; that came later. I had a location in mind; it would be centred on Boyle and Lough Key in county Roscommon. Of course America had a role to play as well. Why Boyle? Well the MacDermot clan were focussed on that area in the past and I wanted to tell a story that would involve their clan. I began with the advice I always gave my students when writing an essay: write about what you know about. Describe places and things you have knowledge and experience of. It works. I could visit and revisit the locations around Lough Key and the Shannon, and like any historian I examined the maps of the area. And there I found Sheegorey; it fitted to perfection, particularly as it was an interesting name “The fairy Hill of Guaire” it would become a central symbol in the novel. Fortunately I had visited all the places I write about in America and had written private journal accounts when there. I had written nothing remarkable but enough to allow me to describe with confidence the various locations. Now I had a plot and locations, all I needed were characters. They came from my imagination; well most of them did, some of them are actual historic personages, O’Sullivan Beare, for instance, was a real person. I believe it is true to say of the fictional characters, that they evolved as the novel progressed. In fact I am quite pleased with them. So it all sounds easy doesn’t it? Not so. The experience of writing is solitary; it is also true that you get better as you practise. Remember the lucky goal scorer, the more I practice the luckier I get, he tells you. When I was writing history I would assemble all my sources, read them and reread them until I understood them and could analyse them. Modern local history theory talks of recreating, re-imagining local communities. This is what I did to some extent. In the novel I recreated from the sources, the events and places and I added my characters and their actions to develop the story. Funnily enough I was also creating sources as I went along. I kept the plot lines in my head and allowed them latitude where necessary. For each character I created a hand written genealogical tree, I edited it as I went along. Each character got their own A4 page where I kept their records. I also edited them as necessary. I could then go back and see what they were up to when last involved in the action. I wrote for four days most weeks for over twelve months, each day I got to between 600 and 1000 words. The next day I would begin by revising the previous day’s work for grammar etc., correspondingly watching out for plot or character digressions or waywardness in direction. So that is how I wrote Sheegorey. Without divulging the plot I cannot go into more detail. Most importantly I enjoyed myself; I often woke at night as the various strands of the novel encroached into my dreams. Usually I ignored the intrusions, but sometimes I got up and scribbled the ideas down, I find I forget my dreams very easily. I began by writing longhand but before long I mastered the art of thinking and committing ideas directly onto a word document. That made a big difference. The hardest task is to make my novel a good seller, I would be happy with that. And that is where I am now, engaged with social media and creating an electronic version of my story. I also want to do an audio edition. And I have already started on my second novel. Joe McDermott was born in north County Dublin in 1948. He spent most of his life teaching History and English, taking early retirement in order to become involved in other artistic endeavours. He is the author of a number of hiking guide books such as The Western Way, The Bangor Trail, and The Foxford Way and has created a number of hiking trail “Apps” for iPhone and android in conjunction with Mayo County Council. He also authored the history of St. Mary’s Hospital Castlebar. Joe scripted, narrated and directed “The Father Manus Sweeney Story” for a 1998 re-enactment and “The Belcarra Eviction” in 2001. “Old Port to Newport” is his latest film endeavour as part of Purple Foxglove Films. 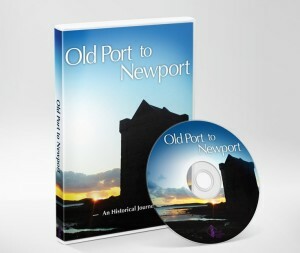 This DVD, scripted and presented by Joe, tells the history of Newport, Co. Mayo. Using JP McDermott as his writing name, Joe has written and produced a number of poetry collections over the years. Sheegorey, a work of historical fiction, is his latest creation. It is based around Lough Key in County Roscommon. 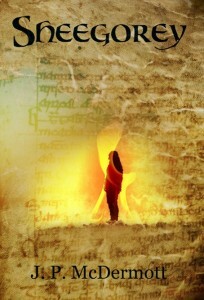 This is a “what if” story of ancient Irish manuscripts with a modern twist. He enjoys walking and cycling and visiting historic and sacred places with his wife Pauline, who is also a published author. Joe is an author, poet, historian, and guided walks consultant. He lives in Newport, Co. Mayo. Scriptwriter and presenter of “Old Port to Newport”, Joe McDermott is the author of a number of fiction and non-fiction books including Sheegorey (historical fiction), the History of St. Mary’s Hospital, Castlebar, as well as hiking guide books such as The Western Way, The Bangor Trail, and The Foxford Way.